All computers, even the future quantum versions, use logic operations or “gates,” which are the fundamental building blocks of computational processes. PFC scientists have performed an ultrafast logic gate on a photon, using a semiconductor quantum dot. Quantum dots are an attractive platform for quantum processing because they live inside a semiconductor material, thus the technology for integration with modern electronics already exists. The protocol implemented here is a Controlled-NOT (CNOT) gate, which is universal, meaning all computational algorithms can be performed using only this simple operation. Light is injected into a photonic crystal cavity containing a quantum dot. Quantum dots have been trapped in photonic crystals before, but the difference here is an added large external magnetic field. The magnetic field shifts around the energy levels of the quantum dot enabling it to simultaneously act as both a stable qubit and a highly efficient photon absorber. 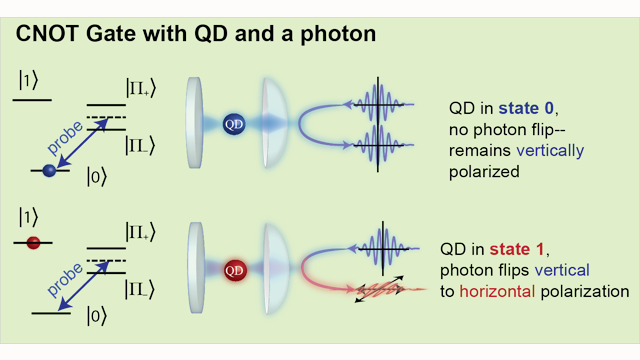 Due to the unique energy level structure of the system, changing the qubit state of the quantum dot can render it completely invisible to the light. This property makes the CNOT gate possible (see figure at right for gate description).